What Day Of The Week Was July 16, 1999? 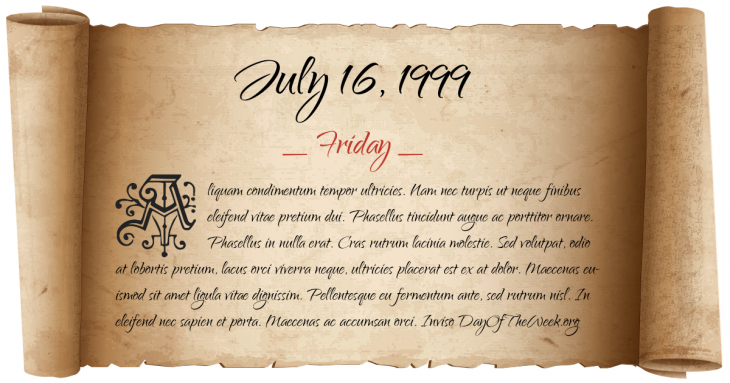 July 16, 1999 was the 197th day of the year 1999 in the Gregorian calendar. There were 168 days remaining until the end of the year. The day of the week was Friday. A person born on this day will be 19 years old today. If that same person saved a Half dollar every day starting at age 6, then by now that person has accumulated $2,513.50 today. John F. Kennedy, Jr., piloting a Piper Saratoga aircraft, dies when his plane crashes into the Atlantic Ocean off the coast of Martha’s Vineyard. His wife Carolyn Bessette Kennedy and sister-in-law Lauren Bessette are also killed.